Kenny Ortega directs this fantasy musical following the children of some of Disney's most notorious villains. 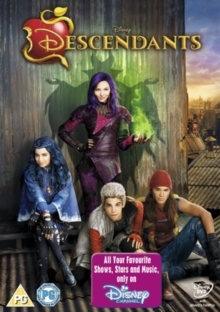 Ben (Mitchell Hope), son of the Beast (Dan Payne) and Belle (Keegan Connor Tracy) and Prince of Auradon, offers a chance at redemption to four teenagers from the Isle of the Lost - Mal (Dove Cameron), Carlos (Cameron Boyce), Jay (Booboo Stewart) and Evie (Sofia Carson), the children of Maleficent (Kristin Chenoweth), Cruella de Vil (Wendy Raquel Robinson), Jafar (Maz Jobrani) and the Evil Queen (Kathy Najimy), respectively. The teenagers are granted the opportunity to leave the Isle of the Lost and attend Auradon Prep, school to the offspring of Disney heroes, where they will have the chance to prove that they can be good people, unlike their parents. But Maleficent orders them to steal their new headmistress the Fairy Godmother (Melanie Paxson)'s wand so that she can use it to control all of Auradon and Mal, Carlos, Jay and Evie find themselves torn between following her orders and doing the right thing.